iWindsurf Community :: View topic - Has anyone gotten out in the waves on the cape this week? 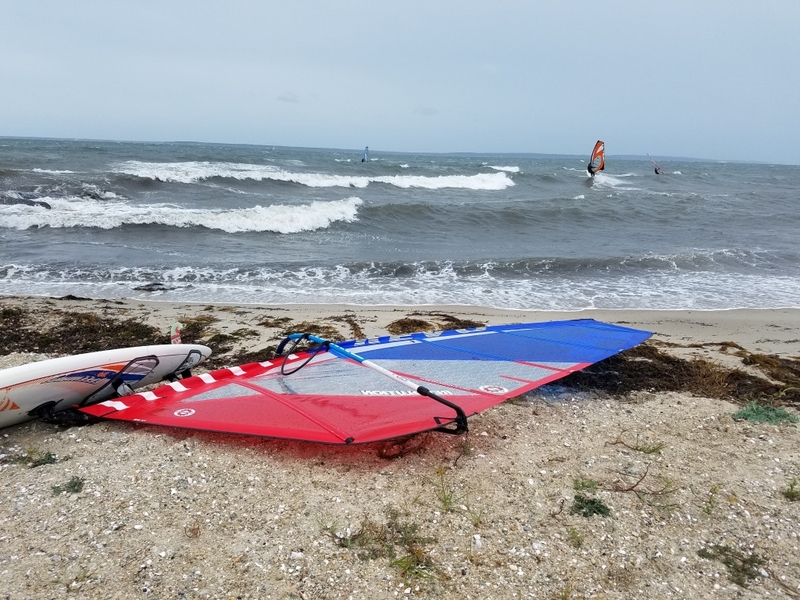 Posted: Wed Sep 12, 2018 2:04 pm Post subject: Has anyone gotten out in the waves on the cape this week? Just trying to live vicariously through stories. I have been visiting and I tried to rent gear earlier in the week when it was windy, but it’s just too tough to find rental wave gear. I did go watch a little of the ABK clinic, and that was fun. Also went to the north side and watched some waves for a while, but no one was there. Chapin is where we went and hung out for a while. Glad you got out! Monday was the day for us in Falmouth. Finally got to use my new 4.5 wave sail in the Vineyard Sound. Big waves. Probably around 25-30 SE. That sail looks really flat and the boom is too long. Was that because you were over-powered on 4.5? It's probably just the picture. It's the first time I rigged this sail, but I have been using Revo's for a long time now. I've tried other sails when I rent in Maui, but I like these, good power for a heavier sailor. It was set for medium power and I very rarely use any outhaul. The newer sails get a bigger pocket when the wind is in them. I was surprised there was not more leach flop. It was gusty, but the sail felt perfect. We don't have a good meter for SE here, so I don't know exactly what it was blowing, probably 25-30. I would have had to downhaul late, if I had carried on sailing, but we sailed from about 10-3, so I was good. mast too stiff? down haul not enough? too much out haul? just wondering. if you liked it, so be it. all the SW sails i have used prior set up like prydes, aerotechs and several others.